While humans are responsible for countless animal extinctions all over the globe, that doesn’t mean animals aren’t capable of doing a little damage on their own. The overall statistics for people killed by animals reveals a very surprising overall figure to most. We sometimes hear about the number of shark-related fatalities in a single year, usually as a means of reminding us that sharks are generally not something we should fear. 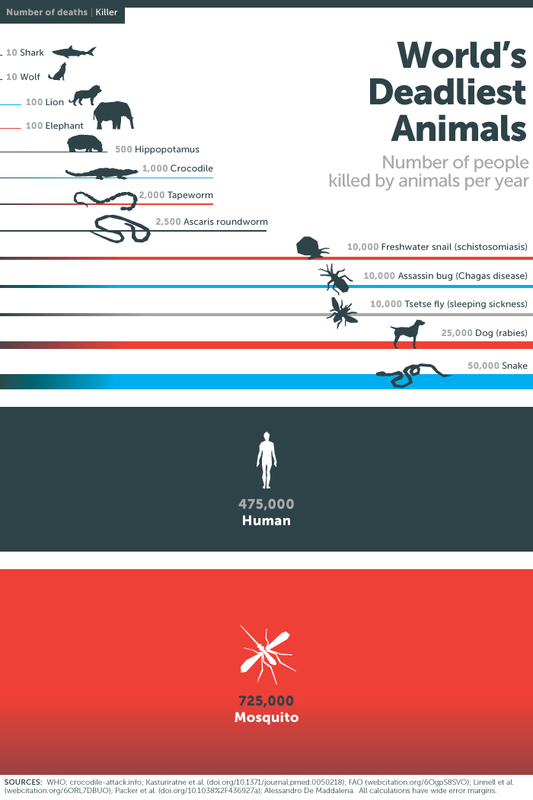 We sometimes run into statistics for the number of people killed by poisonous spiders or alligators. There are several smaller statistics that we sometimes catch bits and pieces of. When you take a serious look at which animals kill people and how many individuals are killed by each animal, you learn a couple of things. One of the first things you learn is that there are some animals out there that just shouldn’t be messed with. The other thing you learn is that the total number of people killed by animals each year is surprisingly high when taken as a whole. 1. 10 people are killed each year by sharks. Only ten. 2. Likewise, only 10 people are killed by wolves. 3. Lions and elephants kill 100 people each. 4. Hippos account for 500 deaths. 5. Crocodiles tend to kill twice as many people as hippos do in a given year. 6. Tapeworms end two thousand lives a year. 7. The Ascaris roundworm is only slightly ahead of the tapeworm with 2500. 8. Due to schistosomiasis, the freshwater snail claims ten thousand a year. 9. The assassin bug also causes ten thousand deaths per year, due mainly to Chagas disease. 10. The tsetse fly causes sleeping sickness, which claims ten thousand lives a year. 11. Due primarily to rabies, 25, 000 people are killed each year by dogs. 12. Snakes are naturally going to place high on such a list. Fifty thousand are killed each year by snakes. 13. How about people? Since we’re technically an animal, human beings come in at second place on the list. We kill nearly five-hundred thousand of our own kind every year. 14. The animal that has the dubious distinction of topping the list are mosquitoes. Mosquitoes kill 725, 000 people every single year. Pretty interesting isn’t it? Animals can certainly do some damage. Hardly surprising human beings come in second.